A robe may seem like a cliché Mother’s Day gift. But this romantic, feminine loungewear is a far cry from the fuzzy terrycloth bathrobes that mothers everywhere are used to receiving. 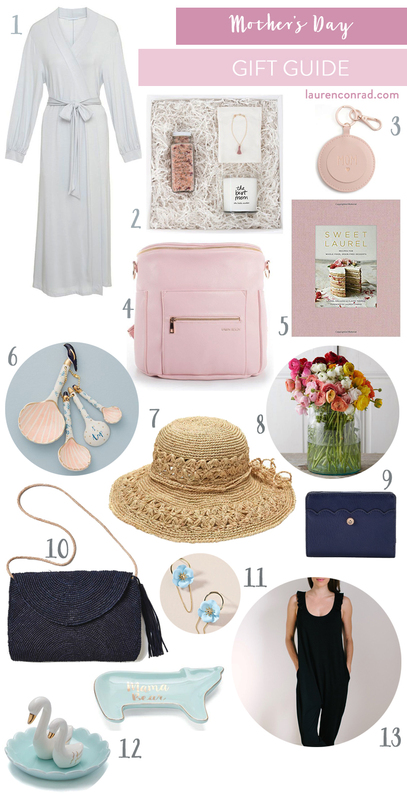 The Little Market makes gift giving as easy as can be with their thoughtfully curated Mother’s Day gifts. Customize your gift box by choosing from all of their different candle scents (from peony to peppermint), soaking salt scents, and bracelet colors, so you can give a gift you truly know your mom will love. Better yet, every box gives back to women artisans, many of whom are mothers themselves. This cute keychain also houses a mirror for a functional touch. 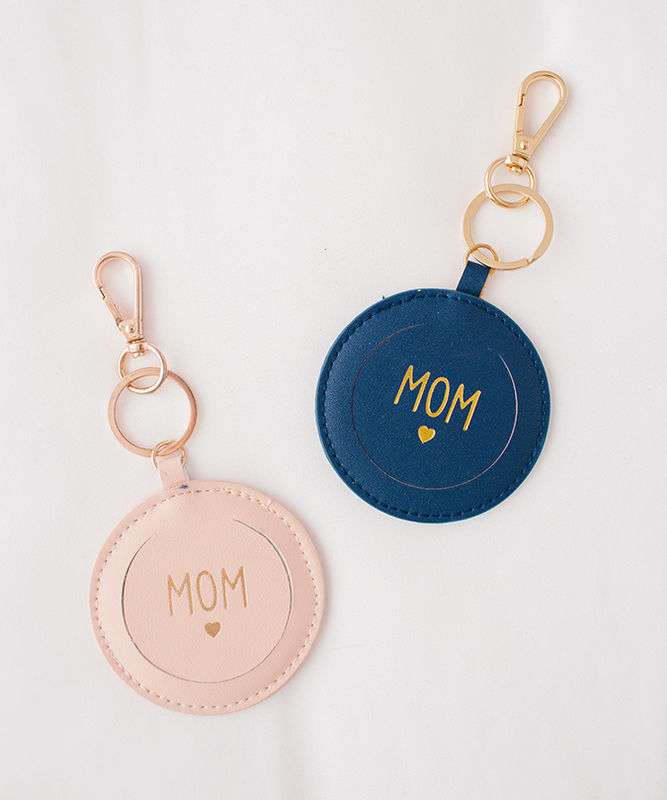 Any mama will love the rose gold toned metal, and the opportunity to display her favorite moniker on her keyring. For any mothers of babies and toddlers, this chic vegan leather diaper bag is a favorite amongst all of our new mama friends. With a bag this chic, no one will suspect that it’s filled with blankets, binkies, and other baby gear. Have you ever seen cuter measuring spoons? We doubt your mom has either. Back when we shared our mothers’ best beauty advice on the blog, we noticed that they all preached the virtue of sun protection. This handmade, fair trade sunhat will keep any mama chic and shaded. Imagine the look on your mom’s face when she opens a box to find 80 ranunculus stems. Especially if you can’t be with your mom on Mother’s Day, this is a seriously show-stopping gift to send. Another pick from Lauren’s Kohl’s line, this chic wallet comes in three colors and makes a great gift for practically any mama on your list. We love a gift that gives back, and each purchase of this beautiful crossbody bag supports female artisans in Madagascar. The mama in your life can bring it to the beach—and everywhere else she goes—this summer season. The perfect mix of classic and on-trend, these pretty bright blue flower earrings have Mother’s Day gift written all over them. We can’t tell you how many times we’ve turned to the collection of LC Lauren Conrad trinket trays when we’re looking for the perfect gift for any occasion. Just our luck, there a few new ones made especially for Mother’s Day like this sweet mama and baby swan duo and this mama bear dish! If the mama on your list still has little ones, she probably understands the struggle that is trying to look cute while chasing tiny humans around all day. The new mamas on our team are in love with this line of rompers designed and ethically produced in North America. They make a stylish replacement for old yoga pants and ratty T-shirts! What are you getting the mamas in your life?